​How Often Should You Have Your Horse's Teeth Floated? True or False: Horses' teeth grow throughout their lifetime. Short answer: False. Horse's don't grow new teeth throughout their lifetime. The story is far more complicated than that. Instead, their very long teeth push (erupt) through the gum line slowly over the course of their lives. Horse teeth come in two different sets. Foals have 24 baby teeth which are pushed out by the permanent teeth. A young adult horse will have teeth which are 4-5 inches long, but the majority of the tooth remains below the gumline. When a horse eats, he grinds his teeth to gnash his food, causing wear on his teeth. Fortunately, his teeth continue to erupt up through the jawline through his life to compensate for this. The rest of the tooth emerges from the jaw, erupting about 1/8" each year. As your horse's teeth continue to erupt and wear down, they can form sharp hooks (usually in the back teeth) which can be painful for your horse, especially when a bit is placed in his mouth. His teeth can also wear unevenly, causing his mouth the close improperly. This also can produce discomfort or pain for your horse. This is why equine dentistry is so important. A equine professional who is qualified to perform equine dentistry can be a life saver for your horse. The practictioner (usually a DVM--doctor of veterinary medicine) will "float" your horse's teeth. This is done by filing down the sharp hooks and smoothing out any unevenness. Most veterinarians today use power equipment to perform floats rather than files or hasps. This type of equipment allows the process to be done quickly and with a great deal of precision. The risk with power equipment is that the tooth can become quite hot, causing permanent injury to the nerves or tooth itself. Experienced equine dental practitioners will irrigate your horse's teeth, use short the equipment in short bursts, and feel the teeth frequently to prevent such injury from occurring. Other tooth problems can usually be identified during the procedure, such as infected or impacted teeth. Should my horse's teeth be floated manually or with power tools? Dr. Tom Daugherty owns Advanced Equine Veterinary Practice in Stamping Ground, KY. He has been specializing in equine dentistry since 2001. Dr. Daugherty advises using both manual and power equipment to properly float horse teeth. "I believe that each set of tools has its advantages," he explained in a recent EquiMed interview. "In my opinion, a better overall job can be achieved with power equipment, but I still use manual tools in certain cases as well as for fine-tuning." The primary disadvantage of manual tools is that they rely solely on the brute strength of the equine dentist who must manually force the tool back and forth in the horse's mouth in an attempt to file down incredibly hard enamel. This often means a long and tiring session for both the horse and the practitioner. When using a manual rasp, the practitioner is also often working blindly without a speculum or special lighting in the mouth cavity. Dr. Daugherty points out that "Power tools let a veterinarian do more precise work in much less time and with dramatically less physical effort. For instance, a horse with a major hook or step on its molars can have adjustments made in a shorter time frame, which results in less discomfort for all involved." What are some signs that my horse's teeth need to be floated? Common signs include dropping food when chewing, weight loss, and "quidding" where your horse packs balls of hay and grass into its cheeks. According to Dr. Daugherty, your horse does this to put a barrier between sharp enamel teeth points and her sensitive cheeks and tongue. You may notice balls of hay in your horses stall, undigested food his her stool, or puffy cheeks on your horses face. According to Dr. Daugherty, horses under the age of 5 should be floated every 6 months because there are many changes going on in the horses mouth during this period. Foals should be examined shortly after birth to diagnose and correct congenital dental problems. He points out that yearlings have been found to have enamel points sharp enough to cause damage to the cheeks and tongue. Between the ages of 5 years of age and 20 years, horses should be floated once a year, unless you or your veterinarian observe or suspect any problems. Horses over 20 years of age should be examined every 6 months and floated only if needed. What are Wolf Teeth and why should they be removed? Wolf teeth are "left-overs" from the horse's ancient past. They are usually found just in front of the first molar in the upper and sometime the lower jaw. If they haven't erupted through the gum, they are called "blind wolf teeth". 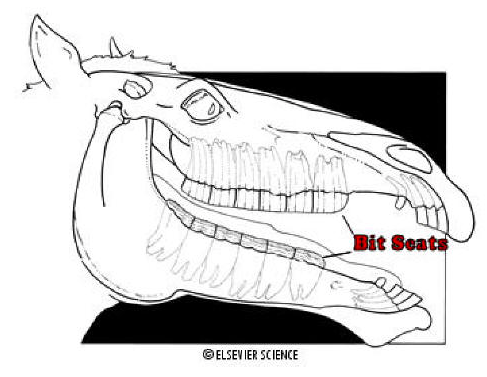 A bit seat is a modification of the horse's molars that allow the horse more comfort when wearing a bit. The upper molar that lies behind the bit is smoothed down towards the gum line. The corresponding lower molar is rolled towards the lower gum line. And that is pretty much everything you need to know about caring for your horse's teeth.